There will be a Celebration of Life for Bruce Selleck ’71 in the Colgate Memorial Chapel on Saturday, October 14, beginning at 3:30 p.m. A reception will immediately follow the celebration in the Ho Atrium, Robert H.N. Ho Science Center. In addition, the geology department will be holding a reception at the Colgate Inn in the Green Room at 8:00 p.m. for alumni and friends of the geology department. Editor’s note: Provost and Dean of the Faculty Tracey Hucks ’87, MA’90, sent this remembrance to the campus community after the passing of Thomas A. Bartlett Chair and Professor of Geology Bruce Selleck ’71 on July 31, 2017. 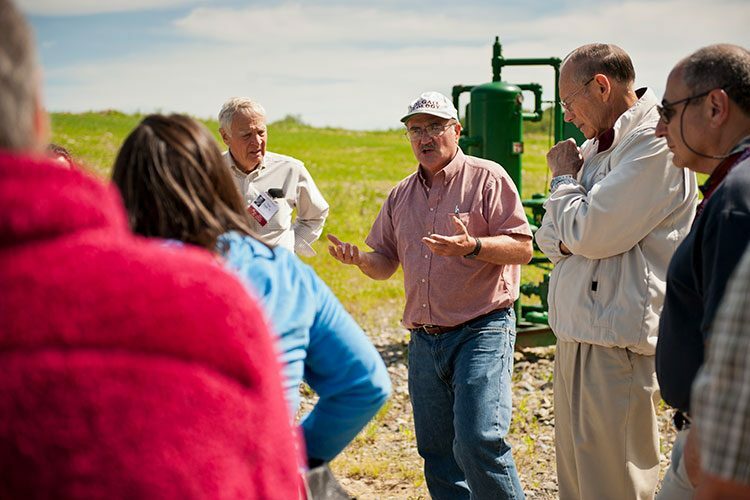 Professor Bruce Selleck had deep ties to the upstate New York region, where he grew up on a small, rural dairy farm appropriately known as Selleck’s Corners, near Canton, N.Y., on the western edge of the Adirondack Park. Bruce also had deep ties to Colgate as both a scholar and an athlete, receiving a BA in geology in 1971 while playing four years of varsity soccer. Bruce left Colgate to pursue his MA and PhD degrees at the University of Rochester before returning to his alma mater as a faculty member in the geology department in 1974, a time span that he frequently referred to as the “inter-Selleckian period,” the only interruption of his 50­-year association with Colgate. Bruce was a renowned expert on the geology of the upstate New York region. His scholarship initially focused on sedimentary rocks in the area, with a focus on understanding what these archives revealed about ancient marine environments and how they had changed over time. As his career progressed, Bruce expanded his research areas to Alaska and Australia and developed new expertise in geochemistry to help understand the histories of these regions. With longtime colleague and friend James McLelland (Charles A. Dana Professor of geology, emeritus), Bruce later expanded the scope of his research to include understanding the tectonic development of the Adirondack Mountains. During the course of his career, Bruce published dozens of articles in top-tier scientific journals, including the Journal of Sedimentary Research, Geological Society of America Bulletin, American Journal of Science, and Geology, to list a few. Bruce recently co-edited a special issue of the Adirondack Journal of Environmental Sciences — which included several articles co-authored by Bruce and other members of Colgate’s geology department — summarizing recent work on the geology and natural environment of the Adirondack region. In recognition of his research, Bruce held appointments as the H.O. Whitnall Professor of geology and was the current Thomas A. Bartlett Chair and Professor of geology. Bruce’s love of teaching and his affection for his students were legendary. Many of Bruce’s ideas on teaching were shaped by his own educational experience attending a one-room schoolhouse for elementary school. This experience led him to be a strong believer in the power of small, intimate classes where students and teachers worked closely together towards a common goal, a model that he replicated in many classes at Colgate. Bruce taught a wide range of courses, including Environmental Geology, Earth Resources, Marine Environments, Hydrology and Surficial Geology, and his signature course on Stratigraphy and Sedimentation. Bruce was also passionate about getting students into the field to learn geology and frequently took students on trips around the country to classic geologic localities through the Techniques of Field Geology summer course (the Off–Campus or “O.C.” program) as well as the Geology of America’s Parks course. Bruce treated his students as part of his extended family, both caring deeply for their academic and personal development while also expecting the best of them. His dedication to teaching and close relationships with students inspired countless Colgate graduates to pursue careers in geology in both academia and industry over the years, leaving an enduring legacy on the field of geology. Bruce received the Colgate Alumni Corporation Distinguished Teaching Award (1998), the AAUP Teacher of the Year Award (2006), and the Sidney J. and Florence Felten French Prize (2010) in recognition of his outstanding teaching. Bruce was also deeply committed to the geology department and to Colgate as an institution. Within the department, Bruce was a generous and inspirational mentor to many young faculty members as they began their teaching careers. Bruce took on many formal leadership roles, including chair of the geology department (1983–1986 and 2003–2006), associate dean of the faculty (1988–1990), dean of the faculty and provost (1990–1994), and interim dean of the faculty and provost (2011–2012). In addition, he served as chair of the Promotion and Tenure Committee, director of the Picker Institute for Interdisciplinary Science, and director of the Upstate Institute, as well as a host of other committees too numerous to mention. Bruce was a significant contributor to Colgate’s study groups, leading multiple trips to Wales and Australia. He also served as an advisor to a range of sports teams, clubs, and Greek organizations. In addition to his extensive service to Colgate, Bruce was a strong believer in contributing to the broader community, as shown by his service on the Town of Lebanon planning board as well as the boards of the Friends of Rogers Environmental Center and the Adirondack Research Consortium. Bruce leaves behind his beloved wife of 46 years, Nancy Barlow Selleck ’76; their two daughters, Caity Selleck (Jim Murphy) and Beth Selleck Fiore (Chris Fiore); grandson Cooper Murphy; Bruce’s two sisters, Linda Selleck Kershlis and Laura Selleck (John Jenkins); Nancy’s sister, Cindy Lawrence (Kevin Lawrence); and his nephews, Zachary and Adam. Gifts in memoriam may be sent via the Colgate University advancement office for the Rich April–Bruce Selleck Endowed Fund for Geology Student Travel or directly to the Friends of Rogers Environmental Education Center, Sherburne, N.Y.
A memorial service is being planned for October 14 at Colgate with further information on this event to follow. We remember our dear colleague, teacher, mentor, administrator, scholar, department member, and friend with the warmest regards.